In a rare public talk and Q&A session as part of the London Festival of Architecture 2017, Alison Brooks will be sharing the ideals and design approach behind the newest building to emerge on the Oxford city skyline; the Exeter College Cohen Quad. ABA’s campus is due for completion later this year, making it the first complete College commissioned by the University of Oxford since Powell & Moya’s 1974 Wolfson College. The Cohen Quad is a 21st century reinvention of the collegiate quadrangle, the basis of Oxford’s academic and urban fabric. Weaving together themes of collective memory, spatial experimentation, and the contemporary narrative of the city, the talk also addresses the architect’s role in creating generous and humane platforms for social exchange. The design of the new quad is based on three key concepts: the journey, places of gathering and sense of home. These concepts are embedded in the formal layout of the building, the variety of its spaces, and its shimmering, curved stainless steel roof. The 6,000m2 Cohen Quad offers a new institutional model for education and creativity. At its heart is the Learning Commons; its multi-layered spaces speak of a future where socialising, eating, drinking, studying and teaching will merge and evolve in a multitude of ways. 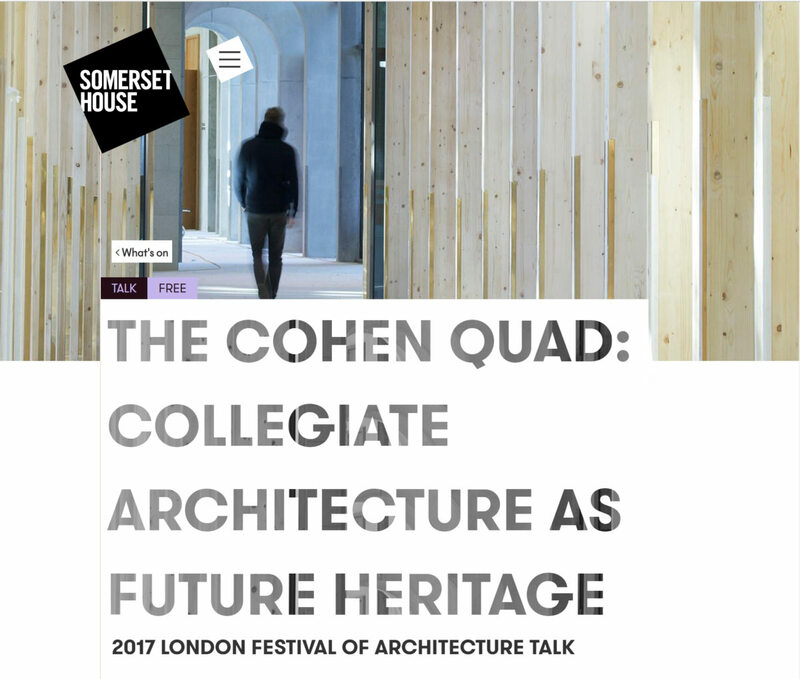 The Exeter College Cohen Quad talk will take place on the 22 June at 2pm in the Embankment Gallery of Somerset House. Entry is on a ‘first come, first served’ basis; please arrive promptly to secure a place. The London Festival of Architecture is Europe’s biggest annual architecture festival, and returns to the capital from 1-30 June 2017 with hundreds of events exploring ‘memory’. It celebrates London as a global architectural hub, provokes questions about the life of the city, and promotes positive change to its public realm. For more information on the festival, visit www.londonfestivalofarchitecture.org.